Blake Koch qualified 21st for the Lilly Diabetes 250, followed by Cale Conley in 25th, David Starr in 27th and Eric McClure in 32nd. The 250-lap race included three cautions for 16 laps and eight lead changes among six drivers. Cale Conley finished the 250-lap race 21st, followed by Eric McClure in 29th, David Starr in 36th and Blake Koch in 37th. Cale Conley and the No. 14 IAVA team headed to Indianapolis Motor Speedway with high hopes. It was the rookie’s first time competing at the famed Brickyard. Conley qualified his Toyota Camry in the 25th position and spent the first half of the Lilly Diabetes 250 steadily moving through the field. By Lap 50 of the 100-lap event, Conley had broken into the Top 20. Unfortunately, Conley lost a lap to the leaders and was unable to regain it, finishing the event in the 21st position. The 4th Annual Lilly Diabetes 250 at Indianapolis Motor Speedway started off with a hurdle for Eric McClure and the Reynolds Wrap® team. Starting from the 32nd position, McClure knew he had some ground to make up at a track that way not necessarily “passing friendly”. As the field took the green, McClure radioed that his Camry was experiencing a tight condition and slipped two spots to 34th by lap eight. An early caution on lap 12 helped McClure’s team try and aid the right handling with a chassis adjustment. McClure’s pit crew helped him make up grounds on track, as he restarted 24th. The Reynolds Wrap® crew continued to work through the remaining two cautions and a green flag stop on lap 62 to earn a 29th place finish. David Starr in the No. 44 Zachry/Hard Hat Heroes (BYF.org) Toyota Camry, qualified 27th for the Lilly Diabetes 250 XFINITY race at Indianapolis Motor Speedway. With an early in the race caution, on lap 12, Starr radioed the car was “not bad”. Crew Chief Greg Conner called the Zachry Camry to pit road for four tires and fuel. At the green flag restart, Starr was scored in the 26th position. 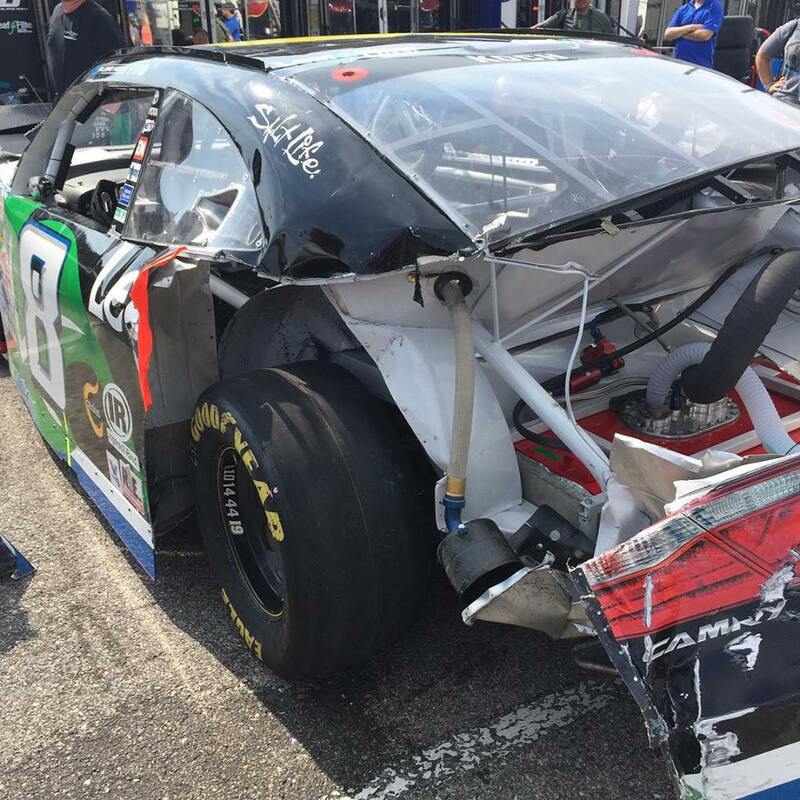 On lap 23 of the 250-lap race, Starr was involved in an accident and sustained heavy damage to the right side of the No. 44 Zachry Camry. The team made every effort to repair the car in hopes rejoining the field, but it was ultimately determined the damage was too extensive and the Zachry team ended the day 36th. Driver QUOTE: “Frustrating day for our Zachry/BYF Hard Hat Heroes Camry. I was looking forward to running the race, our car was getting better and moving up through the field. Unfortunately, we got caught up in a wreck that ended our day early”. Blake Koch and the No. 8 LeafFilter Gutter Protection Camry started the Lilly Diabetes 250 from the 21st position on Saturday afternoon. Early into the race, Koch reported that his Camry was tight into the entrance of turn one. The team came to pit road on lap 14 for four tires, fuel and a track bar adjustment. On lap 23, Koch was involved in a wreck, which ended his day at Indianapolis Motor Speedway.